In the pre-digital world, language learners weren’t exactly spoilt for choice. Find a private tutor in the small ads? Enrol at a local language school? Get hold of some self-instruction audio cassettes? Online technologies have blown language learning opportunities right open. With asynchronous online courses, videos, podcasts, MOOCs and blogs, there’s no end to the amount of content available. But content isn’t everything. And, while effective language bots may not be far off, most learners still opt for some form of human tuition. Here, too, there are digital options. In the current culture of immediacy, we want what we want, and we want it now. So, the thought of contacting a language school, completing a level test and waiting to be assigned to a class is almost unthinkable. Not only is this process unacceptably slow, but the prospective learner is unlikely to have any say over the time and location of the lesson, let alone decide on the teacher. The accessibility, individuality and flexibility of online tutoring is pulling more and more language learners away from face-to-face modes of learning. But what does this shift away from the classroom mean for teachers, learners and the ELT industry? Online tutoring is an educational format that looks set to grow, well into the next decade. In part, this rise has been driven by improved internet speeds, increased international connectivity and the developments in telecommunication software. 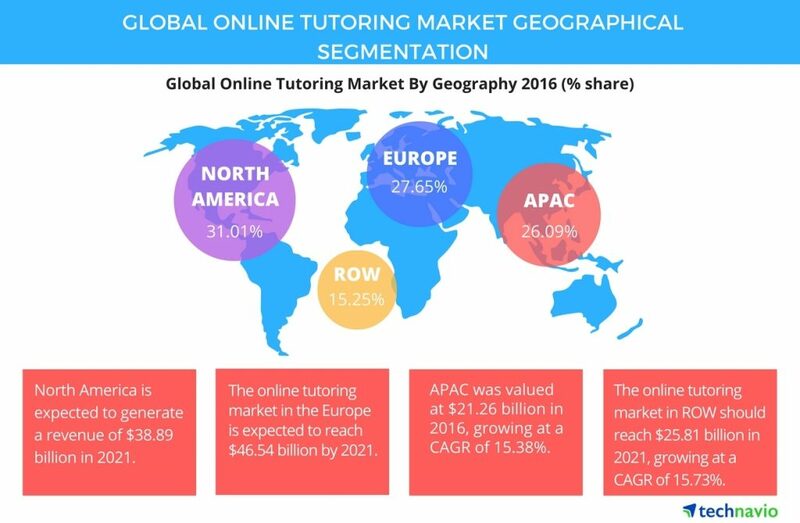 Here’s a geographical breakdown of the current online tutoring market from Technavio. Key demand areas include tuition for STEM subjects, higher education entrance exams and, as we’ll see in more detail, languages. Online language tutoring can be accessed via a range of services. The providers of these services can be categorised by their size, as well as by the underlying business model they follow. We’ve identified five core categories – from the individual freelancer, through to some of the education industry’s biggest players. Attracted by the convenience and flexibility of working from home, the chance to develop a personal brand and increase earnings, many teachers are choosing to go it alone. What do you need to get started? Jaime Miller, director of online school English Success Academy, recommends using a platform that’s user friendly, like Wiz IQ or Zoom. As for online promotion, with easy-to-use website builders like Squarespace and Wix, it’s never been easier. The potential reach is enormous but, in this truly global market, creating an online presence as an individual is far from straightforward. Success with this model lies in finding a niche and striking a balance between the time spent marketing yourself and the successful recruitment of students. Read more about how to grow your online teaching business. Peer-to-peer (P2P) learning platforms were quick to capitalise on this problem of self-marketing. They serve to bridge the gap between learner and teacher. Examples include Skooli and, more specifically to languages, italki and Verbling. These started out as little more than directories of qualified, verified, independent teachers. However, as they’ve grown, they’ve begun adding new features (e.g. virtual classrooms, scheduling tools, payment options) that facilitate the whole tutoring process. Such features not only bring added value, but they also help discourage users from taking lessons ‘off-platform’, reverting to the previous model. After all, these companies take a commission of around 10-15% for each lesson taught. This next model consists of agencies that contract teachers and market their services. There’s an abundance of online work on TEFL job boards. In fact, there are now websites, such as Oetjobs.com, that exclusively post online positions. Key players in this category include the Chinese-based companies VIPKids and iTutorGroup. The former employs over 40,000 teachers to meet the needs of more than 300,000 students. Whereas the latter claims to be the largest English-language learning institution in the world. Demand for teachers by these companies is high, but remuneration remains relatively meagre. Even so, with the promise of regular work and a fixed wage, this is a trade-off some teachers are willing to accept, especially those who are inexperienced and/or benefit from a low cost of living. The big players in ELT have also been quick to embrace online tutoring. In 2014, Pearson launched Pearson English Interactive (PEI), a 4-level online course. Similarly, EF have EF English Live, which superseded EF Englishtown. The main problem with online tutoring for these providers relates to scalability: one of the main benefits of online tutoring for students is that it offers one-to-one attention. Unfortunately, that dynamic simply doesn’t allow for growth on a large scale. The approach by companies like Pearson and EF has therefore been to provide blended e-learning programmes. They include some form of online tutoring, though the majority of the course content is completed independently by the learner, who then receives a mix of automated and human feedback. The result is a product that can compete with the flexibility of online tutoring, while keeping human-hours to a minimum. Following this approach, we’re also likely to see a development in the application of voice user interfaces (VUI) and chatbots, to assist learners with language practice, correction and feedback. Every technological disruption creates opportunities for some and spells the end for others. So who are the potential winners and who’s likely to lose out? Most importantly, online tutoring puts the learner back in the driving seat. Tomorrow, they can wake up and choose from any number of languages, take their pick from thousands of teachers and start learning. This is especially good news for professionals in need of flexibility or individuals living in remote areas. The next set of winners are the tech savvy teachers. Even with basic web skills and marketing know-how, teachers now have an opportunity to tap into an enormous market and work remotely. Then P2P platforms, such as Verbling, have already established themselves in the industry and look well-positioned to increase their market share. The fact that learners can now find teachers all over the world, at all budgets, is likely to hit bricks and mortar language schools hardest. In particular, small to medium-sized language schools, which have previously benefited from being one of the only local providers of language courses, may find that their captive market is no longer captive. However, with change comes opportunity. Schools should be looking for innovative ways to meet the ever-changing needs of their learners. From simply offering online classes via Skype, Google Hangouts or Zoom, to developing their own blended learning or other on-demand solutions, there’s plenty of scope to take action. Finally, the global access to tutoring may increase the competitive pressure on non-native teachers. Broadly speaking, the tide does seem to be turning in terms of discriminatory job ads, however some companies still uphold ‘native-only’ policies. Verbling, for example, only accepts applications from native teachers. Unless such policies are challenged, a significant proportion of professional language teachers may be excluded from the exciting new opportunities online tutoring can bring. Do you teach online? Does your school offer Skype lessons? What are the advantages and disadvantages? Let us know in the comments. Hi Tim. I absolutely agree with your point about remuneration often being meagre. I have done some teaching on iTalki and it simply doesn’t add up for me financially. The highest most students seem to be prepared to pay on iTalki is $20 / hour. The teacher gets $17 after iTalki’s commission. That’s about £13. After withdrawal fees, I’ll get about £12.50 for the hour. When you consider that about 30 minutes of preparation needs to go into each personalised private class, doing 1.5 hours of work for just £12.50 is not very attractive. In fact, it is barely minimum wage in the UK. As a qualified teacher living in the UK I would be looking for more than minimum wage. This is unfortunately a symptom of the inequality in the cost of living between English speaking countries and many of the less economically fortunate countries that have a big appetite for learning English. I think this way of teaching can be worthwhile for teachers living in countries with a low cost of living but, for a teacher in the UK, I don’t think it’s worth it. I personally love italki! My schedule didn’t start to thin out until I started charging over $50 USD per hour. Below that threshold, I taught as much as I wanted. I think it comes down to the messaging to students, the overall appeal of your profile, and student outcomes vs expectations. Very good overview of what to me seems to be a still surprisingly overlooked aspect of ELT (while its presence is hardly avoidable in the online teacher groups I’m involved with, it does not yet seem to have made much of a dent on the conference circuit to my knowledge). I’ve worked my way up via Edtech language providers and have finally reached a rate of pay that is comparable to what I used to earn teaching IELTS at uni. Try Speexx (you can find them on Linkedin) they really are the best outfit I’ve worked for in the last 4 years online. I had to turn to online teaching out of desperation when the brick and mortar school I work for couldn’t offer me enough hours. Two years later, almost half of my teaching is done online. Advantages? There are plenty. It’s great in terms of CPD. I had to learn and experiment with many different tools and platforms, find online resources, adapt my teaching style and really think “outside the box”. You can work from anywhere that has a stable internet connection. And you can cover a much bigger market than the city you’re physically based in. Disadvantages? Time zones. At the beginning I had to work early in the morning on Saturdays as it was the only time I could connect with my students from Japan and Russia. Also scheduling lessons, student support, marketing and other admin takes time if you’re working as a 1-to1 tutor. You do need to be pretty tech savvy and know how to market yourself. I’d also add that being a non-native speaker became my USP when teaching online. As a Russian speaker living in the UK, I was approached by many Russian parents who wanted lessons for their children but couldn’t communicate with native speakers in English. Hiring me was a win-win situation.